But enough about me--you already know I exist, because you're here! The GAL is all about community: designers supporting designers, knitters supporting indie designers, and so on. Here are some of my favorite GAL picks that I'm contemplating adding to my queue. Knit Me With Your Best Shot by Mary Annarella. I had the pleasure of trying this sample on at a trunk show and it was gorgeously flattering. I am definitely feeling pullovers more than cardigans this year (forever cold club!) and I think this classic style would work well in my wardrobe. However, I don't think I have any stash suitable for this and I'm trying to use up a good chunk of my stash before I buy any new sweater quantities. Rib Run by Jennifer Dassau. 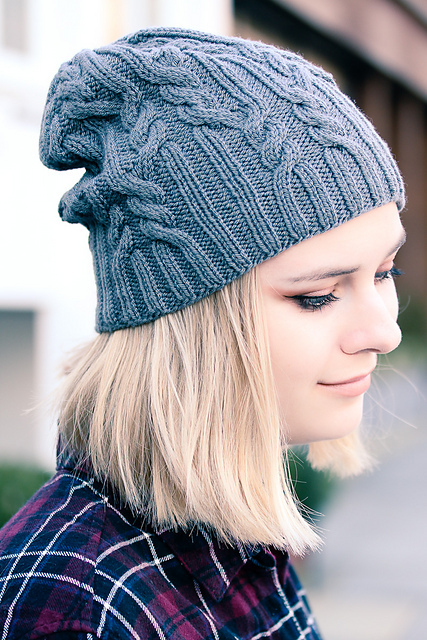 This simple cable and ribbed hat is super appealing to me. I already have an extensive hat collection, but there's always room for one more, right? Most of my hats are worked in hand-dyed yarns, and this looks like a good excuse to play with a beautiful solid color. Calentito by Kristen Jancuk. These adorbale slipper socks have been in my queue since the day they were released, so I'm definitely snapping this one up! I have quite the stash of sock yarn and some partial skeins, both of which will be perfect to use up in several pairs of Calentitos. Wheatly Socks by Kerri Blumer. Can you tell that I really, really need to knit more socks? I would love to have an overflowing handmade sock drawer, and a long-term goal of mine has been to work on knitting more socks! I love this simple textural stitch pattern, it would be perfect for some subtle semi-solid skeins I have. I'd love to hear what you're stocking up on during the Indie GAL and what project you're planning to cast on first! In January, my good friend Kirsten gave me a beautiful skein of local wool she had hand-spun and hand-dyed. It's wooly and sheepy, but not irritating, and the resulting yarn is lightweight and airy rather than being a dense, bulky yarn. It's beautifully thick-and-thin, ranging from super bulky to super fine and plied with a weaving yarn. It's the kind of thing I wouldn't actively spin myself since I can't intentionally spin irregular yarns, but I love the play of color and texture! The skein was giant so I decided to knit a cowl end-to-end in the hopes of using up every last yard. I chose brioche because it's fun to knit, I don't have many brioche accessories, and I thought it would play nice with the yarn's varying thickness without having to settle for garter stitch. Not that I hate garter stitch, but sometimes you want something more interesting! I cast on provisionally and knit on a US 10.5 needle until the strip was long enough to loop around twice, blocked it flat, then twisted it intentionally and kitchenered it closed. Surprisingly, I didn't use up all my yarn! I think I have enough left for a pair of super simple fingerless mitts, or at least that's what I'm hoping for. This was a really satisfying, quick knit and it's a great addition to my cold-weather accessory wardrobe. The teals and blues go with a lot of my clothing and I like how versatile long cowls like this are, with the choice of leaving it open or looping it double. Thank you so much for the yarn, Kirsten! Looking for some knitting motivation? Join the Accessorize Yourself KAL! From August 15th to September 30th, choose any of my accessory patterns and knit along with us in my Ravelry group. My currently available self published accessory patterns will be 20% off from now until the start of the KAL with coupon code ACCESSORIZE, so if you've been waiting to pull the trigger on one of those designs, now would indeed be the time! Of course, I am offering lovely prizes to the victors. The grand prize for one lucky person will be a one-of-a-kind skein of Valley Yarns Charlemont Hand Dyed, a Blue Sky project bag and 2 free patterns of their choosing (from my self published patterns only) from now until the end of 2014. You'll want to save at least one of those because I have some awesome fall releases coming up! I'll also pick two runners up who will each receive 1 free pattern of their choosing, same stipulations as above. Head on over to the KAL thread and join in! What better way to close out summer and kick off fall right than with a beautiful accessory and sparkling Internet conversation, eh? I've once again teamed up with Gynx Yarns to bring you an amazing accessory collaboration! Meet Advice From a Caterpillar, my contribution to Laura's Alice in Wonderland themed kit she is debuting at SSK this month. Laura contacted me asking if I could whip up a one or two skein accessory design to fit her planned theme and of course I had to say yes. She is always a joy to work with--not only is the yarn beautiful, but she trusts me as a designer and lets my imagination run wild. Laura dyed up three exclusive Wonderland inspired colorways just for the kits (my shawl uses 'Wonderland') and asked Little Skein in the Big Wool to contribute a matching project bag. Take a look! I happen to have one of those project bags myself (advance perks y'all!) and the construction is FABULOUS. Really sturdy and the fabric is adorable. In case you couldn't guess it from the name, my shawlette drew inspiration from the Caterpillar. I have to admit, I am a bigger fan of Through the Looking Glass but I wanted to go with the original book for this one. I was imagining the cables as wriggly caterpillars at first, then I realized the cables' transition to ribbing and back again was an apt metaphor for metamorphosis. Caterpillar to butterfly, Alice to Big and Little Versions of Herself, and so on. Pretend you're an art student and fill in with your long-reaching explanation of choice. As luck would have it, this turned out to be the most perfect photoshoot yet! Lighting, location, styling--everything was on point to create a magical mood. If you're not attending SSK, look for kits/preorders to appear in the Gynx Etsy Shop around July 22nd. I'll make an announcement when the pattern is available for individual sale. Til then, beware of the Jabberwocky, eh? Sometimes, even when you're crazy busy (like "I probably shouldn't sleep for the next month" kind of busy)...you can manage to make something for people you love. I hinted at it on Instagram with this picture, but I made each of my parents hats for their birthdays this year. It's been a few years since they got anything handknit (selfish knitter for life, yo!) and I figured it was time once more. My mom's was at the end of February, so she already got her version of my Tamborim pattern because she admired mine at Christmas so much. Hers is sans pom-pom and the length is slightly shorter. My dad's birthday is today--hopefully you get your hat in the mail before you see this blog post, Papa!--and for him I decided to improvise. Please ignore my terrible lighting and bad self-photography skills. I used the brim construction from my Free Cecily Hat, but worked it for longer so he has a nice thick brim to cover his ears when walking, hiking or cross-country skiing. The body of the hat is an oversized garter rib pattern that I "made up" but probably already exists: Knit all sts on Rounds 1 & 2, *k2p2* on Rounds 3 & 4. I winged the crown decreases and tried to keep the ribbing intact as it narrowed. Yarn is Dream in Color Classy, possibly in Cloud Jungle--I had it in my stash without the label. I'm really pleased with the end result! Sometimes it's nice to create without writing everything down with plans to publish it, and I like knowing that my papa now has a one-of-a-kind creation. I am a pretty newb crocheter. My most notable project to date, a cute summery tee, is currently languishing half-done. (Oops.) I enjoy the rhythm of crochet, but my excuse is the same one for selfish knitting--I don't have time! 98% of my knitting time is devoted to design work and at most, I manage to squeeze in a small accessory project to break up the monotony of creating beautiful things you then have to send away instead of showing off. It's a hard life, this designing. Cue violins. Anyways, last night I tried the crochet chain provisional cast on for the first time instead of the usual provisional cast on with waste yarn I use when knitting. LOVE it, so much easier. Unfortunately, picking up a hook made me start daydreaming about all the crochet projects I'm dying to start. What better way to spend a snow day than fantasy yarn shopping? The Holla Knits KAL* just kicked off this week and I wish I was right there with everyone working on a Deco Daisies of my very own! I love this sweet and flowery cowl, which I think would be perfect in a color changing yarn with long repeats like Knitting Fever Painted Desert. I'm thinking something pink and purple-y for the ultimate feminine neckwarmer. I loved this sweater so much that I bought the issue of Interweave Crochet as soon as I saw it. Once I have time, it's waiting for me! Of course, as a Tosh addict I couldn't resist dreaming of Madelinetosh Tosh Sport color combinations for this. I love Heuchera but have yet to use it in any projects and would make it the main color of the Fall Fields Cardigan so it can take center stage. My coworker and crochet design maven Sara once said that hand-dyed yarn looks great in crochet and I couldn't agree more. I love Fable Fibers' colorways and couldn't pick just one! This yarn sudden death match comes down between Orchid and Lucky Penny, both in Fable Fibers Story MCN. Each would give the Sugar Sparkles Shawlette a different vibe and I can picture either color at home in my wardrobe. I'd love to grow my crochet queue, so share your favorite patterns or designers with me! 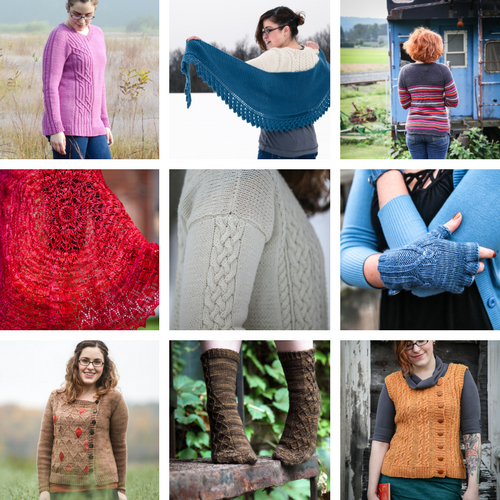 *There are tons of cool prizes in the Holla Knits KAL, including my self-published patterns and the Pantonal pattern collection--incentive to join in if you've been waiting to whip up any Holla Knits patterns! The end is nigh--er, I mean here! Tamborim is the final installation of the Pantonal pattern club. Emma's Silly Pattern Naming Theme continues! Since the color is called Samba, I went Wikipedia-ing to find related terms that also happen to be cool sounding words, et voila. A tamborim is a type of Brazilian drum used in samba music. The more you know! This super quick slouchy hat features garter stitch triangle details on the body for a simple but effective textural detail. I love the way Laura's tonal dye work looks here, the harmony of design + yarn are really working for me. It starts with a picot turned hem (side note: I love turned hems! They look so clean!) and is topped with a pom pom--optional if you like, but mandatory if you know what's good for you. Especially if you live somewhere snowy. Pom pom is non-negotiable! We shot this in front of some really fun graffiti of a soundwave in downtown Northampton. You can read all about the project and see more photos here! Tamborim will be available to you non-club riffraff on June 1, 2014. If you hate feet, look away quick! Meet Canephora, the second installment of the Pantonal club collaboration between myself and Gynx Yarns! This is my first ever sock design because trying new things is fun, right? So this experience was a mix of that "wow this is way easier than I thought it would be" feeling and the "wait this is TOO easy am I forgetting something important?!" sense of panic. Aside from a few minor snafus, these babies went pretty smoothly and I'm thankful for that. The name continues in my theme for this project--the Pantone color is Carafe, Laura's version is called Cafe, and canephora comes from the Latin name for Robusta coffee, Coffea canephora. I'm not a big coffee drinker, since I try to avoid unnecessary sugar whenever I can and I'm too much of a pansy to drink my coffee black! So this is my dose of toasty coffee-brown goodness. Available to non-subscribers on May 1st. The first installment of Pantonal, my club collaboration with Gynx Yarns, is now out! 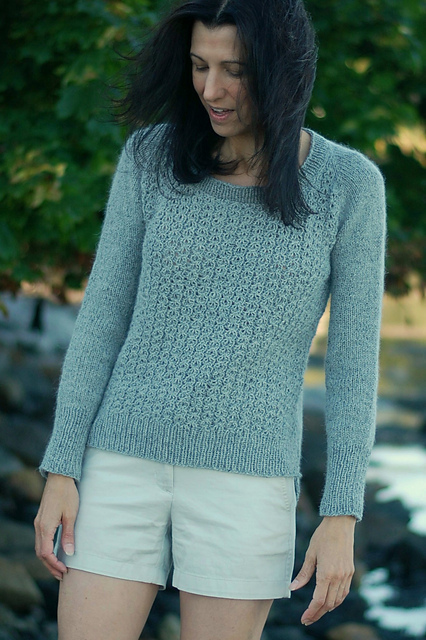 Yarn has been shipped, PDFs have been emailed, and I can't wait to see Lecanora on the needles of club subscribers. I'm supremely happy with this lovely lace stole. While I've designed patterns with lace touches before, this is my first all-out lace attempt--charted and everything!--and it worked out fabulously. I love how the lace patterns flow into each other and get progressively lighter and more ephemeral as you work from the center outwards. I decided to be a little theme-y with this club and based the pattern names off the color names. This color is Lichen, and Laura created a gorgeous and interesting mix of green and grey with hints of reddish flecks. Lecanora is a genus of lichen...you get the idea! Itching to get your hands on the pattern? If you're not a club subscriber, you'll have to wait until April 1st. Thaaaat's right: new pattern time! All photos in this post by the amazing Topham Photo. Introducing the Brooklyn Bridge Mitts! Show off your Brooklyn pride and warm your hands with the Brooklyn Bridge Mitts, no matter what 'hood you call home! These mitts feature traveling cables that mimic the arches of the Brooklyn Bridge, set on a reverse stockinette stitch background that transitions to stockinette after the cables are completed. A thumb gusset provides a comfortable fit and you can opt for individual finger holes or a completely fingerless treatment. With two lengths and two sizes to choose from, plus cute buttoned cuffs, you'll be whipping up a perfect-for-you pair of mitts in no time! The blue sample is Malabrigo Silky Merino and the pinkish grey variegated sample is Malabrigo Arroyo. I love how the pattern looks totally different but still works in the different bases. Single ply, plied, variegated, solid, semi-solid--it's all good! And you've probably figured out by now that I'm OBSESSED with cute buttons so gotta have any excuse to work those in. The ones on the blue sample actually have tiny pictures of the Brooklyn Bridge which is what kickstarted the whole idea! Nothing like a great pair of mitts to win your friends over and provide you with a barrel of laughs when sitting on a dock at 8am on a rainy day, amirite? These babies are MAGIC! Head on over to Ravelry if you want to snag a copy. Big thanks to the lovely folks at Malabrigo, who sent me the yarn as part of their Malabrigo Quickies program.